The weekend that ran long. It’s been a good weekend. One that started off being mostly kid-free thanks to the social life of my girl, who managed to spend the weekend around town with friends, but not with us. As a result, there was quality time with friends new and old, much needed mom friend time and quality time with my dear babydaddy. 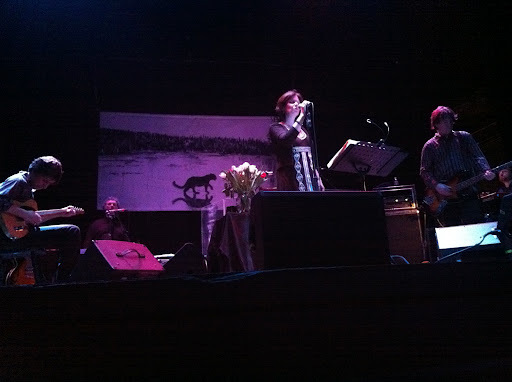 Wine as well as music was involved, with front row seats at Cowboy Junkies Saturday night at the Jefferson. They were lovely, as always. This morning, we got an unexpected holiday. It seems the possible dusting of snow being forecast when I went to bed last night turned into a little bit more than a dusting. 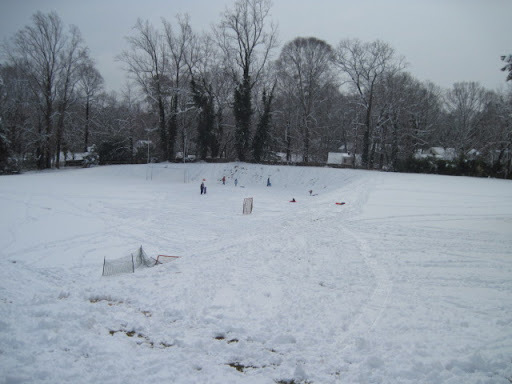 When I woke up and saw snow on the skylights in our bedroom, I checked to see what the schools were doing. A two hour delay. I rolled over and went back to sleep, only to be woken up by Edie just before 9 am, informing us she had seen cars sliding on the hill next to the house and she hoped she was not expected to go to school in this mess. And that is when we discovered we were having a very unexpected snow day, despite the fact that spring has been coming on strong for a few weeks now, albeit early. 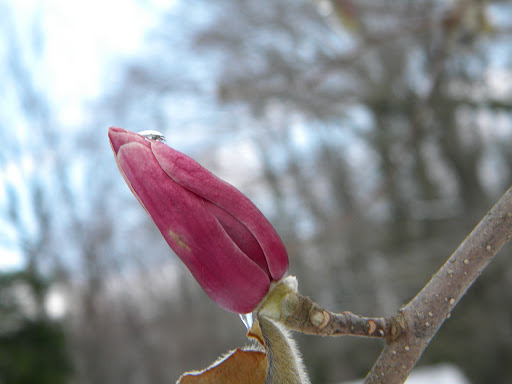 The tulip magnolia in the front yard has been making strides towards blooming, so while the hints of pink in the snow are lovely on it, I’m worried it will be a giant brown mess for the next month. When it blooms, it is pink and glorious, the first sign of spring that you can see for a good block, no matter what angle you come at it from. 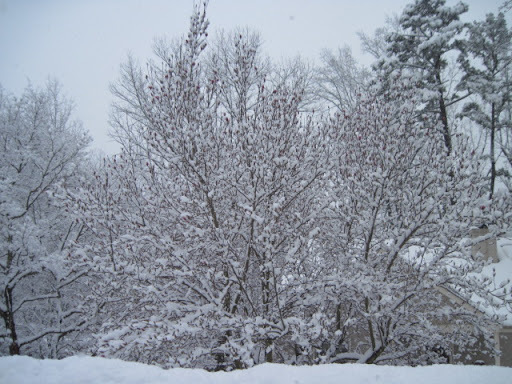 When it blooms and gets pinched by cold weather, as happens most years, it turns brown and just looks sort of sad and then we have to wait for the dogwood to bloom for a glorious pink corner. 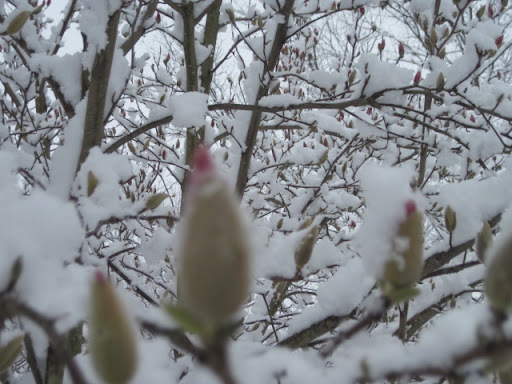 It’s not blooming yet, so hopefully the snow didn’t hurt it too much. As I walked by this morning, the pink showing through the snow was lovely. If you click on it, you can see a bigger view, one that shows the pink more. 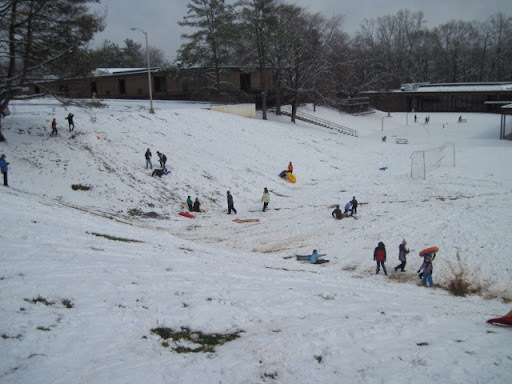 One of the things I love about this neighborhood is that a snow day automatically means everyone heads to the hill at Walker School to sled. 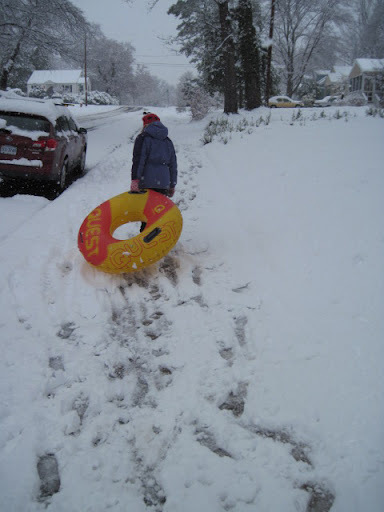 We brought the tube, although the sleds were faster on this snow. Thankfully, everyone shares and is willing to swap rides. 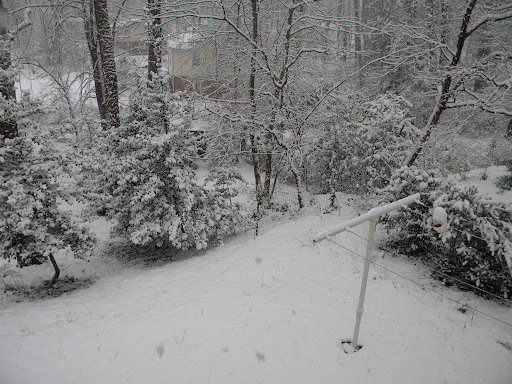 It was the kind of snow that was perfect for snowmen. 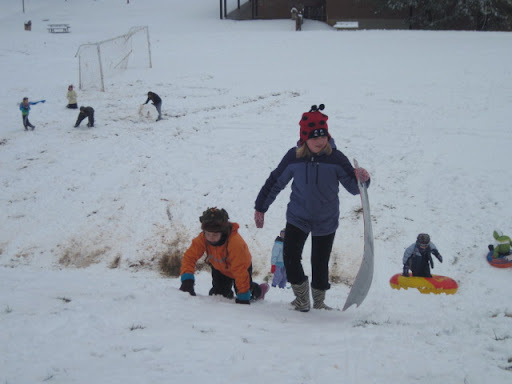 He later went down the hill on a sled, because snowmen need to sled too. 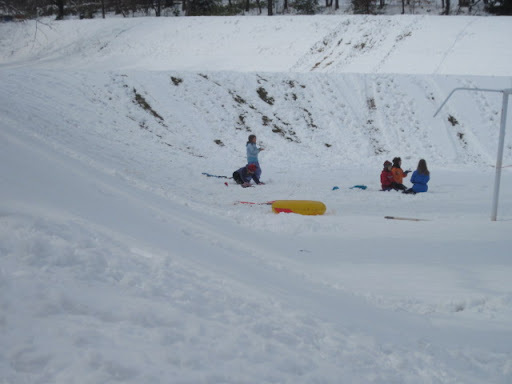 We may have gotten 6″, but the sledding cleared the hill of snow in no time. There was much joy and merriment. I managed to miss the mud puddle there at the bottom when I wiped out. 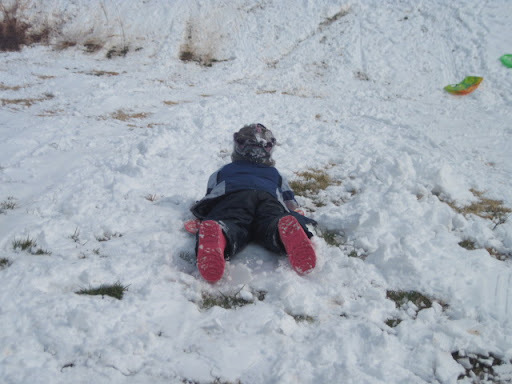 I blame the wipe out on the small child that wandered into my path as I was going down the hill and to avoid running her over, I ended up rolling. But hey, I didn’t take a small child out. That may be a first because I’m good at taking out small children when I sled. There was a group of wanna-be snowboarders that kept to the smaller hill. 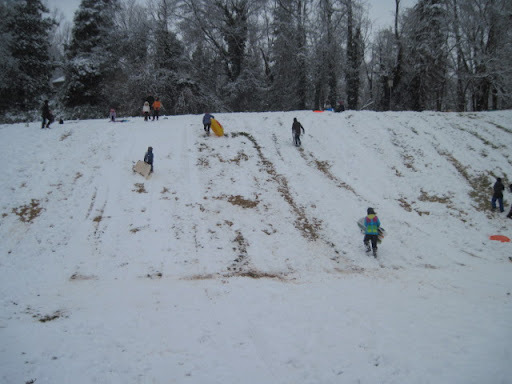 Although every one of the hills up there are nice and steep for good sledding. Right around noon, the snow suddenly stopped, the sun came out and it started melting. 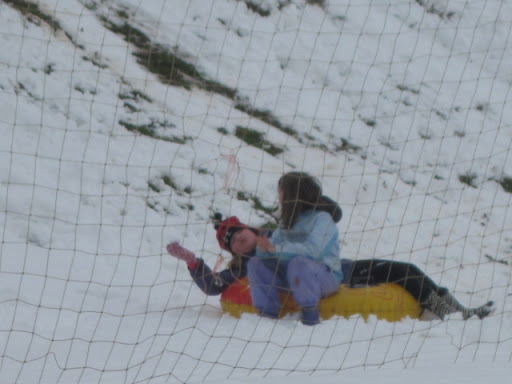 I think the kids were tired by that point though, as evidenced by Edie & Emily sitting on the tube, eating snow. 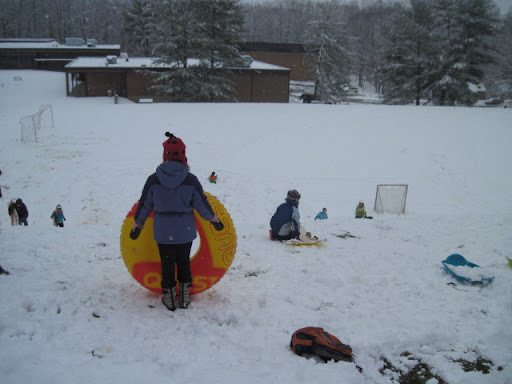 A tube in the snow is a much better seat than a sled, that’s for sure. On the way home, I got some shots of early spring in the snow. Some fared better than others. 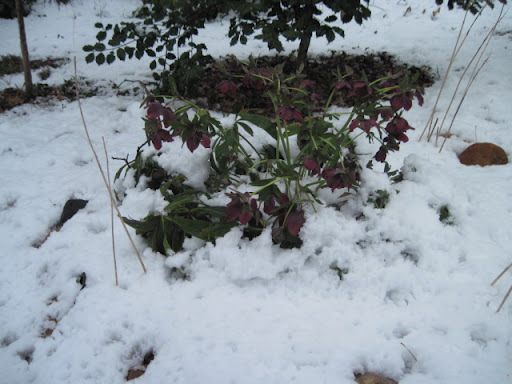 The hellebore was not looking as majestic in the snow. 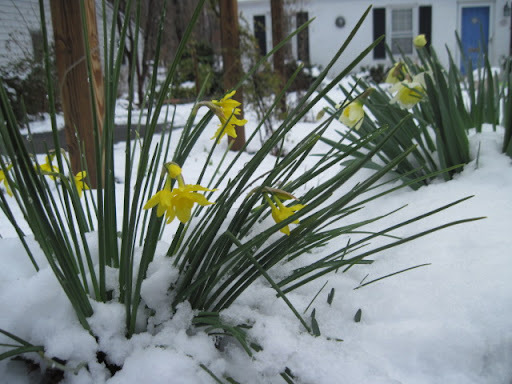 There you have all my little garden markers from the greens I planted a few weeks ago peeking out above the snow. If you look closely, you can see the tiniest hint of the arugula sticking out of the snow in the back. On a walk through the ‘hood the other day, I saw someone else’s arugula bolting. Somehow it made me feel better about mine bolting. We may have gotten snow today, but it’s supposed to be warm again by the end of the week, so the arugula is just going to keep bolting. Hopefully the new seeds I planted will do something soon, so I don’t have to go without arugula. 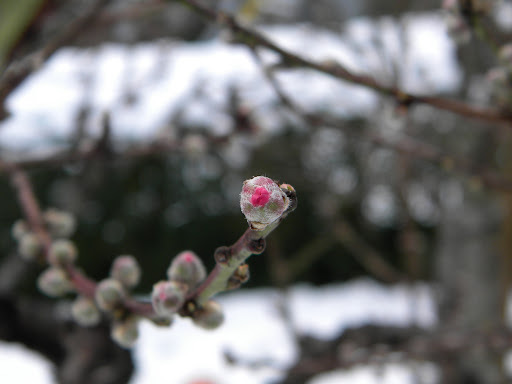 The peach tree is getting ready to flower too. If the tulip magnolia does become a brown mess, at least I captured some of it’s pinkness. We do have quite a bit of pink blooming trees in our yard, don’t we? 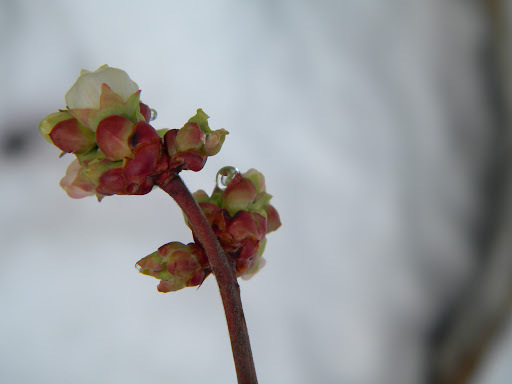 Icicles on the blueberry blossoms. I’m not sure we’ve ever noticed blueberry blossoms this early, and from the looks of it, there are bunch on there. Last year was the first year they did anything and I noticed the other day, one of the bushes has grown about 4 feet, doubling the height of it, which means they are starting to take off. I guess we should look up if frost is bad for the blossoms. When I woke up this morning, I was tallying a mental list of things that needed to happen this week. The unexpected holiday threw that out of whack. 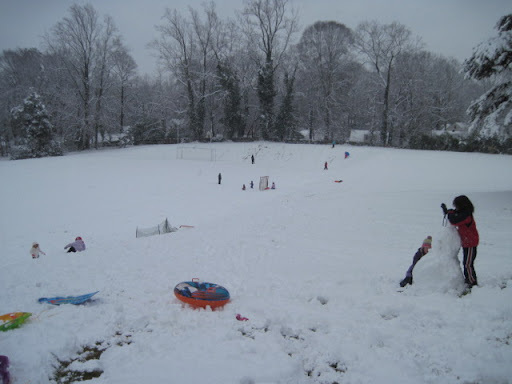 I went from thinking about what I want to do to the garden to realizing what we really needed today after sledding was hot cocoa and brownies, with tomato soup and grilled pimento cheese sandwiches, products of last year’s garden, for dinner. As much as I want winter to be done, I realized today I’m not quite done with hot cups of tea and long wool skirts yet. It was a nice surprise to end a good weekend. We had grilled cheese sandwiches and left-over chicken soup. And brownies! Well, I had a brownie. The guys, who are both diabetic, had strawberries and blackberries (huge tasty ones!) over sugar-free cheese cake pudding. Best of luck on the tree blooms. No brown allowed this year! I did love looking at your snow pictures. I am glad to read you had a little R&R over the weekend. 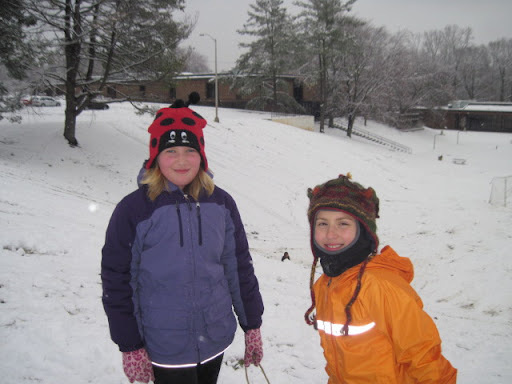 Hope we can get to the sledding hill in this single good snowfall we got over the weekend.